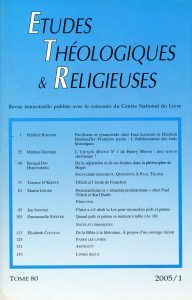 Études théologiques et religieuses > Articles > JOOSTEN Jan > Christ a-t-il aboli la loi pour réconcilier juifs et païens ? Recent research on Eph. 2:15 has argued that Christ abolished the Law to allow the reconciliation of Jews and Gentiles within the Church. Jan Joosten offers here a different view establishing that the reconciliation of the two groups is operated not by the abrogation of Law as a whole but by some of its rules: what is at stake in this passage, he says, could be the limitation imposed on social relations between Jews and non-Jews, in particular commensality. One possible translation would be: « He made the two into one, breaking down the wall that divided them. He cancelled the law of commandments concerning some particular ordinances ».